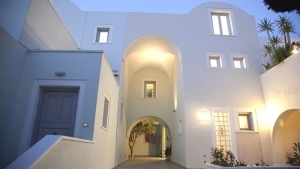 Alizea Villa & Suites is a 3 star hotel located near the centre of Fira Town. 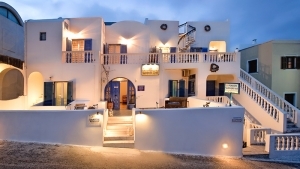 It offers single, double and triple rooms, all with air conditioning, a fridge and a TV. 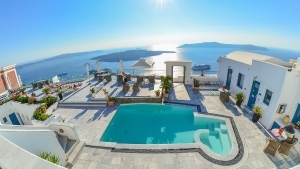 All rooms have their own private balcony, while some of them offer views to the Aegean sea. Breakfast is offered in the pool area or in the rooms. Guests can relax in the garden or around the pool. Staff at the reception desk can offer information on bars and restaurants and arrange for car or bike rentals. The Alizea is at 9 km distance from the famous Black Beach of Kamari and 12 km from Port of Athinios. 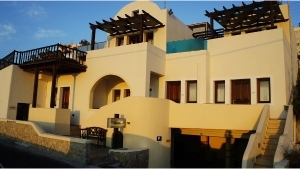 Garden, Non-Smoking Rooms, Safety Deposit Box, Luggage Storage, Air Conditioning. Services: Breakfast in the Room, Bicycle Rental, Car Hire, Tour Desk.